From shower remodeling to custom kitchens, room additions and more, we are here to help. Call us or click below for a quote. BKR Pros is a leading kitchen, shower and bathroom remodeling company with affiliates in the Atlanta area. We also serve surrounding areas like Johns Creek. We have more than 20 years experience in all phases of remodeling and are here to earn your business. In an enclosed shower or tub area, most codes call for enclosed, vapor-proof down-lights. Use caution when positioning them, however, you don't want them looking right into the light when you're lying in a tub. An infrared heat lamp mounted just outside the tub or shower will help avoid chilly exits. All switches should be located at least 6 feet from the tub and shower. Stall lights: In toilet compartments, plan on installing a centered ceiling fixture that used a 75 watt incandescent bulb. The Right Light: Most experts recommend using incandescent bulbs in the bathroom and shower, because the light they produce has natural, complexion-flatter properties. But these bulbs also produce a good deal of heat that's often unwanted. Compact fluorescent fixtures are a good alternative. They demand far less electricity per lumen, and the tubes render a warm, pleasing spectrum of color. Consider using a dimmer switch for your bathroom and shower's overall lighting. This will allow you to adjust the light to suit your needs and moods. Dimmers also make nighttime visits to the bathroom more bearable, since the light can be turned down below the blinding level. Be sure to install a switch by either doorway so you don't have to cross the bathroom in the dark. Use wall space wisely in your bathroom. Hang towel bars above one another. Cap a row of robe hooks or pegs with a shelf; hang towels on the hooks and stack washcloths on the shelves. Add shelves wherever practical. This could be almost anywhere in the bathroom, since many shelving products come in a variety of widths and can be cut to any length. Corner shelves take advantage of frequently wasted space. Create an illusion of spaciousness with glass or mirrored shelves. Revamp an existing closet by converting the bottom half into a chest of drawers or a built-in laundry hamper. 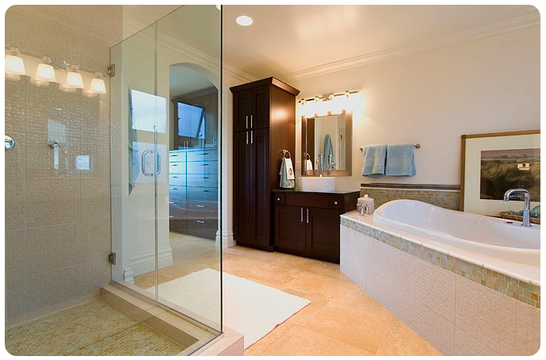 Install open shelves or cubicles for rolled bath towels in the upper portion. Bring in items from other rooms. Chests of drawers, china cabinets and antique kitchen cupboards add character and storage space. Just remember to finish wood furniture with a moisture- resistant sealer to prevent warping. Shelving units that glide out work better than drawers, because storage items stay neat instead of getting in a jumble. Framed with moldings that match the door, a built-in storage unit can be carved from space often overlooked in baths - the area between the end of the bathtub or shower and the wall. This is a common remodeling request we receive from Atlanta homeowners.